A light and deliciously refreshing dessert to serve after a spicy main course, such as harissa chicken with chickpea falafels. Look out too for our Tastes of the Middle East brochure. Preheat the oven to 180°C, gas mark 4. Brush three sheets of the filo with a little melted butter. Arrange the sheets on top of each other and cut into three even-sized rectangles. Repeat with the remaining filo. Press each rectangle into a deep muffin tray. Cook in the oven for 8-10 minutes, until golden. Remove from the tray and cool. Place the mango wedges on a non-stick baking tray. Cut off the ends of the pineapple and remove enough skin so the flesh is smooth and free from 'spiky eyes'. Cut in half lengthways and remove the core from each half. 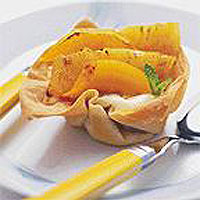 Cut one half into thin, even-sized wedges and place in the baking tray with the mango. Increase the oven temperature to 200°C, gas mark 6. Sift half the icing sugar over the fruit and bake for 15 minutes. Toss the fruit in the cooking juices then glaze under a preheated hot grill for 2-3 minutes. Leave to cool. Chop the other pineapple half and place in a food processor with the remaining icing sugar and the seeds from the vanilla pod and pulse until smooth. Gradually beat into the Mascarpone. Fill the tartlets with the Mascarpone mixture and top with the baked fruit. Garnish with mint leaves and serve immediately. Variation Prepare the fruit and filling following the recipe above. Pile into meringue nests and garnish with mint leaves. Prepare the fruit and filling following the recipe above. Pile into meringue nests and garnish with mint leaves.